We use ebay and other online auctioneers so often that we even forget what a revelation the system was when it came on board. Auctions were no longer a process that occurred behind closed doors on antiques and vintage collectors items for the sole benefit of the rich, obsessive and greedy, and you could now be that mystical phone bidder from across the country who wants to snap up a nice bargain or investment. 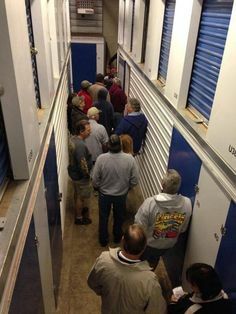 Just as storage auctions have gained prominence through all sorts of media channels, now it is the turn of the online storage auction to make its presence known, where in a very similar way to a real life auction you can bid on a unit’s contents. However this is without needing to leave your home, until the time comes that you have to collect your winnings of course. Like a storage auction in the flesh, there is a slight element of not knowing what you are going to get. In the flesh you only get a quick glance at a unit’s contents and likewise online you will have a few photographs. In some cases noteworthy headline items will be listed with the rest being considered a bit of a lucky dip. This means at least online if you know a unit is not to your liking, or does not contain goods in your specialist area, you can move on to the next one in seconds. Another way of looking at it is that you are effectively engaging multiple auctions at once in a much quicker process. Less drudgery of waiting around in the cold on a weekend morning on a remote facility on the offchance that you might pick up something worthwhile. We’ve ascertained that the range of choice can be a benefit to online storage auctions. The other big question though is are you going to save any money doing it this way? Travel expenses may not be as big a factor in the run up to an online auction, but you never know where you might have to pick the items up from afterwards. There is less of a game being played out on the budgeting and bidding too, since you are not carrying a finite amount of cash with you and others in the auction will not learn your bidding tactics after a few sales, hence widening your possibilities. On the other hand, you may have fees to pay should you win on an online auction, but that is no different to the real thing where the hollering auctioneer has his eye on the commission. On the whole I would say that it is a different way of doing things rather than better or worse than a ‘real life’ storage auction. There is faster access to information and diversity of choice on an online auction, but it lacks that tactile quality and also friendly competitiveness of attending a real one. As ever it’s one to try out for experience and see if it works with your business model.